Baby bump at nearly 17 weeks! It’s been a while since I did a pregnancy update! I just entered my 17th week of pregnancy, and I feel GREAT! The second trimester has proven to be far less dramatic and uncomfortable as the first trimester of this pregnancy. In fact, I hardly feel pregnant at all. TMI alert (wow, that was early in the post). I LOVE the 13-17th weeks of pregnancy because I don’t really look pregnant to most outsiders, but I have all of the good benefits that come from being pregnant. Ie: my girls are about 2 sizes bigger than normal and look great, my hair is extra shiny and full, and I have a great excuse to shop for some new fun leggings and shirts for the winter. 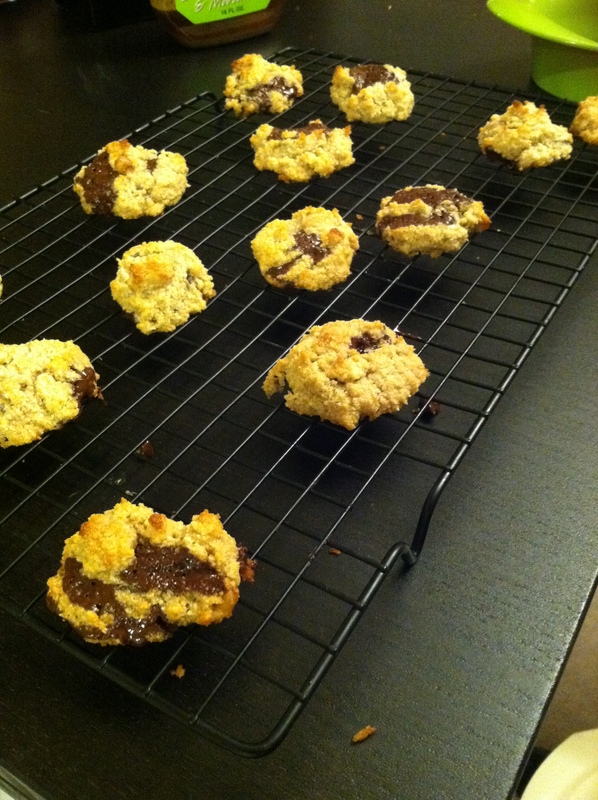 Dark chocolate walnut Paleo cookies. Another TMI alert! One of the worst parts of my first trimester (besides the nausea and exhaustion) was that I was extremely constipated. I mean like awful. And you can imagine all of the *other* fun things that come as a result of being severely constipated. But here’s the deal — ever since I started Paleo, I have been very regular again. It was like a switch turned on and my body started working properly again. Praise the Lord! That was not a fun couple months. Soften the sweet potato in the microwave. I usually put a wet paper towel around it and spear it. Place in a 9×9 greased pan. I have really enjoyed my breakfast casserole. It’s a great way for me to start the morning! So far, I haven’t had to scale back my workouts or modify anything. This week, I did a HIIT (high intensity interval training) workout at home, and strained my back a bit. I think that was due to lack of warming up versus being pregnant though. I’m feeling good and really taking advantage of it now in the gym! I hope this intensity level lasts for a while! You look awesome mama!!! 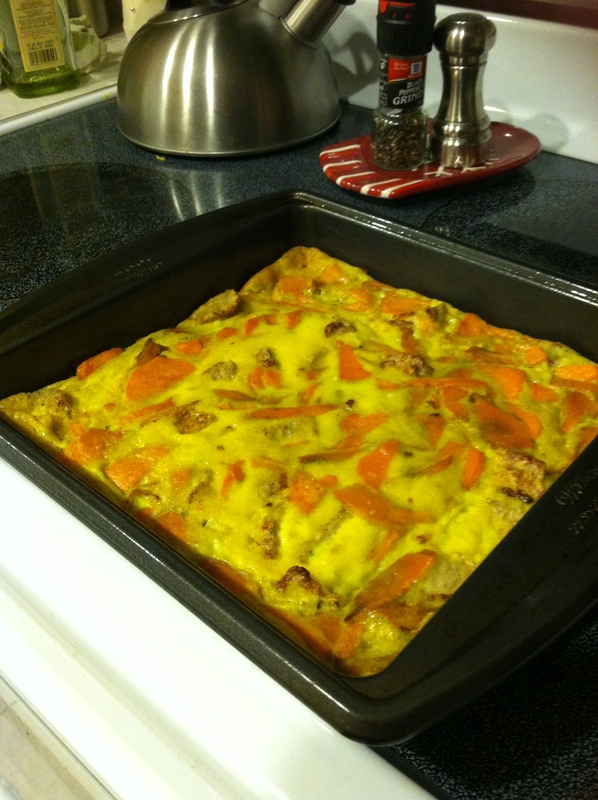 And that breakfast casserole looks super yummy! Ahhh… that “honeymoon phase”. Isn’t it lovely? I’m at 21.5 weeks and still feeling great – such a difference from the first 13 weeks! 🙂 You look awesome! Thanks for sharing the breakfast casserole. Will have to try it! Just found your blog and loving it! I was curious as to how much sausage and bacon you used for the casserole? I tried to make it today but I think my egg to meat ratio was off. Thanks! and I am impressed! Extremely useful information specifically the last part 🙂 I care for such information a lot.